Pasta is a type of food made from flour mixed with water a (and often eggs) which is then kneaded, formed into shapes and boiled. 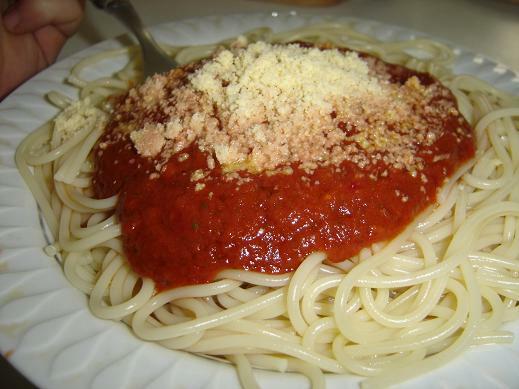 The best-known form of pasta is probably spaghetti which is a long-thin form of pasta whose name derives from the Italian spaghetto, the diminutive of spago which means "thin string". 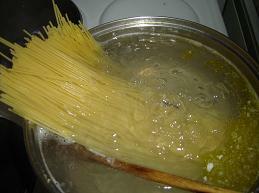 Other than spaghetti, other common forms of pasta include vermicelli (also string like), farfalle and rotelle (complicated decorative shapes), fettuccine and linguine (both ribbon-shipped), lasagna (large sheets), penne (short tubes), as well as various forms of hollow shapes that are stuffed with fillings (manicotti, ravioli and tortellini). Although all the types of pasta are made from more or less the same ingredients, the shapes do in fact serve an important role - different shapes make different types of pasta more suitable for different types of sauce (Alfredo sauce, Tomato sauce, etc.). When pasta is cooked, it can be served with a variety of different sauces. For example, in Italian cuisine, each region of Italy has their own preferred ways of serving the dish. For example, bolognese and pesto are favored in the North, whereas carbonara or tomato sauces tend to be favored in the South. Pasta is also a popular dish outside of Italy, and other countries such as the United States, have developed their own distinct accompaniments, albeit often inspired by Italian cuisine. The origins of pasta have been lost in the mists of time. It is known that noodles have been eaten in China for at least 4,000 years, and one legend says that Marco Polo brought this dish to Italy - however romantic as this story is, it doesn't appear to be true - there are records of pasta dishes in the Mediterranean area dating back from before the time of Christ. The only vegetables book you'll ever need reveals hundreds of ways to cook nearly every vegetable under the sun. We're all looking for interesting, achievable ways to enjoy vegetables more often. This must-have addition to your cookbook shelf has more than 700 kitchen-tested recipes that hit that mark. Sure, you'll learn nearly 40 ways to cook potatoes and 30 ways with broccoli, America's favorite veggies. But you'll also learn how to make a salad with roasted radishes and their peppery leaves; how to char avocados in a skillet to use in Crispy Skillet Turkey Burgers; and how to turn sunchokes into a chowder and kale into a Super Slaw for Salmon Tacos. Every chapter, from Artichokes to Zucchini, includes shopping, storage, seasonality, and prep pointers and techniques, including hundreds of step-by-step photographs and illustrations, gorgeous watercolor illustrations, and full-color recipe photography. The inspirational, modern recipes showcase vegetables' versatility in everything from sides to mains: You'll discover how to make the perfect grilled corn--and also how to transform it into a deliciously creamy pasta sauce with ricotta and basil. Onions are grilled, caramelized, glazed, and pickled--and also cooked into the Middle Eastern pilaf Mujaddara. Cauliflower is grilled as steaks, fried Buffalo-style, and pot-roasted whole with a robust tomato sauce. Sweet potatoes are mashed and baked more than a dozen ways, plus turned into a salad, a soup, tacos, and a gratin. All along the way we share loads of invaluable kitchen tips and insights from our test cooks, making it easy--and irresistibly tempting--to eat more veggies every day. Ninja Air Fryer is an ultra-modern kitchen invention that has introduced а revolutionary way of cooking foods by using hot air. It is invented to prepare meals using as much as 80% less amount of oil as compared to traditional method. It is the perfect solution to enjoy crispy foods at home every day. The recipes are easy to make, delicious and can be served in less than 25 minutes. What are you waiting for? Get your copy now! and Enjoy hassle-free cooking with your Ninja Air Fryer. Do you still think that you do not have perfect genetics and there's nothing that can help you? Have you imagined that eating and cooking a high-fat diet meals would be super easy? Have you ever had an idea of a diet that can be delicious and healthy and can even be better than following any other diets? Then this Ketogenic Meal Prep Guide can help you to save your time and money! With the ketogenic diet, you’re choosing a lifestyle that’s meant to help you reach a healthier, happier you. Like any lifestyle change, it can be a hassle, especially when you’re trying to cook three healthy meals a day after a hard day’s work. That’s where meal prepping can help. This book will teach you meal prepping recipes you can use for breakfast, lunch, dinner, snacks and even dessert. 21 Days Keto Meal Prep Meal Plan, detailing the essential information you need to know to master the very best keto diet dishes you and your family have ever tasted. Learn to cook traditional Italian food for every holiday of the year with Rossella Rago and her Italian nonna in Cooking with Nonna: A Year of Italian Holidays. They’re back! Rossella Rago and her adorable Nonna Romana have returned with Cooking with Nonna: A Year of Italian Holidays, a traditional cookbook no Italian kitchen should be without. This Italian cookbook is a culinary treasury, jam-packed with over 125 classic holiday recipes for Italian-food lovers, including classic holiday recipes like Struffoli, Christmas Fish, Manicotti, Cannelloni, Cannoli Cheesecake, and more. With advice from nonnas all over the country, this unique book covers holiday classics from every region of Italy, from Milan to Sicily, and includes holiday memories from the nonnas themselves. The nonnas also give their personal tips on cooking for a crowd (and it's always a crowd). And, of course, no new Cooking with Nonna cookbook would be complete without Rossella's signature dishes and unique voice. Rosella and her nonnas will have you enjoying Italian culinary delights around the year. In addition to the major holidays of Christmas, Easter, and Thanksgiving, you will find recipes for New Year’s Eve and Day, the Epiphany, Little Easter, St. Joseph’s Day, Carnevale, All Souls Day, Valentine’s Day, Women’s Day, Mother’s Day, and Saint Rocco's Feast. To complete you year-round Italian tasting tour, recipes for weddings and other celebrations are included. Nothing brings family together like delicious food around the holidays, and Cooking with Nonna: A Year of Italian Holidays has everything you need to keep your family full and happy every holiday of the year. 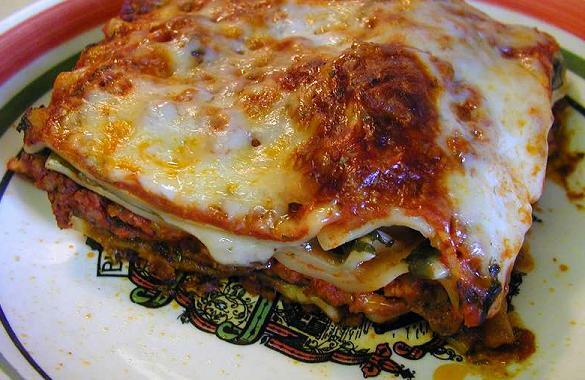 Bring the dishes and the memories you grew up with to a whole new generation of Italian Americans! Learn how to use the best ingredients and simple, classic techniques to make fresh, homemade pasta in your own kitchen with Making Artisan Pasta. Calling for just the simplest ingredients and a handful of unique kitchen tools, making pasta at home has never been easier, more fun, or more delicious. Through author and chef Aliza Green’s pasta expertise and encyclopedic knowledge of all things culinary, plus hundreds of gorgeous photos by acclaimed food photographer Steve Legato, you’ll never look at the supermarket pasta aisle the same way again. Making Artisan Pasta is on Cooking Light's Top 100 Cookbooks of the Last 25 Years list for Best Technique and Equipment. Learn to cook classic Italian recipes like a native with the long-awaited debut cookbook from Rossella Rago, creator of the popular web TV series Cooking with Nonna! For Rossella Rago, creator and host of Cooking with Nonna TV, Italian cooking was never just about the amazing food or Sunday dinner; it was also about family, community, and tradition. Rossella grew up cooking with her Nonna Romana every Sunday and on holidays, learning the traditional recipes of the Italian region of Puglia, like focaccia, braciole, zucchine alla poverella, and pizza rustica. In her popular web TV series, Rossella invites Italian-American grandmothers (the unsung heroes of the culinary world) to cook with her, learning the classic dishes and flavors of each region of Italy and sharing them with eager fans all over the world. Now you can take a culinary journey through Italy with Rossella and her debut cookbook, Cooking with Nonna, featuring over 100 classic Italian recipes, along with advice and stories from 25 beloved Italian grandmothers. If you are ready to bring back Sunday dinner and learn how to make Italian food just like nonna, then look no further! 30-Minute Cooking for Two offers the fastest, perfectly portioned recipes to make homemade meals every day of the week. Imagine if cooking for two cut prep and cook times in half, too. 30-Minute Cooking for Two offers perfectly portioned, time-saving recipes to make whipping up meals for just the two of you, easy to do. Table-ready in 30-minutes or less, these recipes offer fast solutions for meals any day of the week, from a quick breakfast sandwich to a proper date-night steak. Using no more than 8 staple ingredients per recipe, 30-Minute Cooking for Two gives you fewer leftovers, less processed food, and more time to spend between your twosome. Tips for kitchen prep that include shopping lists for pantry staples and essential cooking equipment to stock your kitchen with. 30-minute recipes for breakfast, soups, salads, sandwiches, dinner, and dessert, with quick-reference labels super-fast recipes (20-minutes or less) and one pot meals. 8 ingredients per recipe that are easy-to-find all year around, and make every meal fresh and healthy. Every twosome has a special thing that they do together. With the quick and easy recipes in 30-Minute Cooking for Two, cooking can be your thing, too. A unique and edgy cookbook, Prison Ramen takes readers behind bars with more than 65 ramen recipes and stories of prison life from the inmate/cooks who devised them, including celebrities like Slash from Guns n’ Roses and the actor Shia LaBeouf. Instant ramen is a ubiquitous food, beloved by anyone looking for a cheap, tasty bite—including prisoners, who buy it at the commissary and use it as the building block for all sorts of meals. Think of this as a unique cookbook of ramen hacks. Here’s Ramen Goulash. Black Bean Ramen. Onion Tortilla Ramen Soup. The Jailhouse Hole Burrito. Orange Porkies—chili ramen plus white rice plus ½ bag of pork skins plus orange-flavored punch. Ramen Nuggets. Slash’s J-Walking Ramen (with scallions, Sriracha hot sauce, and minced pork). Coauthors Gustavo “Goose” Alvarez and Clifton Collins Jr. are childhood friends—one an ex-con, now free and living in Mexico, and the other a highly successful Hollywood character actor who’s enlisted friends and celebrities to contribute their recipes and stories. Forget flowery writing about precious, organic ingredients—these stories are a first-person, firsthand look inside prison life, a scared-straight reality to complement the offbeat recipes. Make Pasta That’s Absolutely Magnifico! Discover the joy of creating your own pasta with Homemade Pasta Made Simple. This comprehensive pasta cookbook shows you how easy it is to make delicious pasta and sauce―all completely from scratch. Teaching everything from mixing dough to drying pasta, here’s a pasta cookbook for beginners and experts alike. Want to make farfalle with bolognese? Ravioli with sun-dried tomato sauce? Gnocchi with pumpkin and sausage sauce? Open this pasta cookbook for dozens of simple pasta and sauce recipes that you can mix and match to make your perfect pasta night. A COMPLETE BEGINNER’S GUIDE―Go from noodle novice to pasta pro with this pasta cookbook’s 3 foolproof dough recipes, essential preparation techniques, and a tool selection guide. 65 TASTY PASTAS―Farfalle, tagliatelle, busiati, ravioli, gnocchi…this pasta cookbook teaches you to make, shape, stuff, and cook all kinds of pasta. EASY SAUCES―Savor 30 scrumptious homemade sauce recipes―topped off with ideal pasta serving suggestions. Never settle for premade pasta again with Homemade Pasta Made Simple: A Pasta Cookbook with Easy Recipes & Lessons to Make Fresh Pasta Any Night. Presenting the ultimate resource for every level chef—over 300 recipes for pasta, soups, stir-fries, sauces, desserts and baked dishes! Go beyond spaghetti and meatballs and whip up baked lamb orzo, or a savory squid ink frittata! There are 300 recipes from around the world, and nearly 350 pastas to discover in this definitive book! Easy-to-follow instructions for making your own pasta flow into complete meals for the whole family to enjoy—even those with dietary restrictions! Handy tips and techniques make you the master chef in your home kitchen as you wow guests and savor the fruits of your labor. The Ultimate Pasta and Noodle Cookbook will be a gorgeous keystone addition to any cookbook library! An elevated guide to the craft of pasta-making by rising star chef Thomas McNaughton of San Francisco's hottest Italian restaurant, flour + water. Chef Thomas McNaughton shares his time-tested secrets to creating simple, delicious, and beautiful artisan pasta—from the best fresh doughs to shaping and cooking every type of pasta. A true celebration of Italy’s pasta traditions, flour + water includes fifty seasonally influenced recipes for home cooks of every skill level. The recipes cover the flavor spectrum from well-loved classics to inventive combinations, such as Tagliatelle Bolognese; Pumpkin Tortelloni with Sage and Pumpkin Seeds; Tomato Farfalle with Chicken Polpettine, Roasted Peppers, and Basil; and Asparagus Caramelle with Brown Butter. With guidance from McNaughton and the secrets of flour + water’s dough room, anyone can learn to make amazing pasta at home. An engaging, solution-oriented approach to cooking tempting everyday meals for family and friends. This collectible series of cookbooks focuses on simple, yet delicious dinners for any day of the week, with a selection of recipes that are easy to please all ages and palates. Pasta is the go-to dish for a quick weeknight meal or a sumptuous weekend feast. This book runs the gambit of recipes, showing you how to make enticing and nutritious homemade dinners for any day of the week. Not only goes the book offer a variety of sauces – from pesto to Bolognese to Alfredo, it offers step by step instructions and illustrations for making your own pasta and will widen your repertoire by covering best sauces for various shapes, options for vegetarians, a full array of baked pasta dishes and tasty sides and salads. There’s even advice how to put your town twist on ready-made sauces or finding something that everyone will love. Part of a collectible series that focus on simple, yet delicious dinners for any day of the week, with a selection of recipes that are easy to please for all ages and palates. Also available: Chicken Night, Taco Night and Pizza Night. The first cookbook to explore the best, most authentic Italian pasta sauce recipes from a regional perspective, by food writer, cooking teacher, and Milan native Micol Negrin. The culinary odyssey begins in northern Italy, where rich sauces are prepared with fresh cream or local cheese: Creamy Fontina Sauce with Crushed Walnuts and White Truffle Oil; Parmigiano Sauce with Fresh Nutmeg; Pine Nut and Marjoram Pesto. Central Italy is known for sauces made with cured meats, sheep’s milk cheeses, and extra-virgin olive oil: Spicy Tomato, Onion, and Guanciale Sauce; Smashed Potato Sauce with Cracked Black Pepper and Olive Oil; Caramelized Fennel and Crumbled Sausage Sauce. In southern Italy, simple, frugal ingredients meld into satisfying and delicious flavors: Sweet Pepper and Lamb Ragù with Rosemary; Fresh Ricotta Sauce with Diced Prosciutto; Spicy Cannellini Bean Sauce with Pancetta and Arugula. The islands of Sicily and Sardinia take advantage of the bountiful seafood from the Mediterranean and game from the mountainous terrain: Pork Ragù with a Hint of Dark Chocolate and Cinnamon; Red Mullet Roe with Garlicky Bread Crumbs; Rich Lobster Sauce. Negrin also provides a primer on saucing the Italian way, the basics for handmade pastas, the key to cooking pasta al dente, vital ingredients for every Italian kitchen, perfect wine pairings, and the best food shopping sources around the United States. Complete with mouthwatering color photographs and detailed maps of the various regions, The Best Pasta Sauces lets you travel to Italy without ever leaving your kitchen. Even if you haven’t landed one of the coveted internships in the kitchen at the American Academy in Rome, you can have a behind-the-scenes tutorial in the way that pastas and sauces are made in its kitchen. The recipes in Pasta are arranged in the same order as the interns are taught to make them, from simple to more complex, and are organized the way Italians think about pasta, not only as fresh or dry but by the base of the sauces (oil, tomato, meat, and vegetable). Even the most sophisticated cooks will be intrigued by chef Christopher Boswell’s engaging notes that explain what makes the flavors work together, why and how the sauces work with the pastas, and what makes a dish not only great but unforgettable. He includes simple techniques, small refinements, and easy variations. Among the more than ninety recipes you’ll find ’nduja, a soft, spicy sausage spread from Calabria; a sauce that unexpectedly pairs basil and asparagus; delicate and refreshing summer pastas; and hearty and earthy vegetarian dishes. You’ll find the go-to dish of southern Italian families, made when no one can agree on what they want to eat; a recipe traditionally made by shepherds that uses three ingredients readily found in most modern kitchens; inventive sauces that are riffs on the classics; and iconic sauces whose success depends on something as simple as when to grind the pepper. The influence of Chez Panisse is everywhere in Pasta (Chef Boswell is an alum and the Rome Sustainable Food Project at the American Academy was founded by Alice Waters). Sauces—and even meatballs—are often lighter than their Italian counterparts. Flavors are bright. Ingredients shine. Each dish tells a unique story. Create your own pasta using simple and clear step-by-step instructions through 80 incredible recipes, each with its own photo. As more people look to create a restaurant experience at home, readers will be surprised at how easy it is to make their favorite pasta dough and take their cooking to the next level with Nicole Karr, whose popular classes and pop up restaurants sell out in a flash in Brooklyn, New York. Whether you choose the handmade pasta option or have a pasta-making machine, there is something for everyone. Just one bite of fresh pasta and readers will never want to buy premade pasta again. Nicole complements the fresh taste of handmade pasta with creative and delicious recipes for sauces to round out the meal. Impress your family and friends with fresh handmade pasta dishes that are unique in flavor and presentation and fun to make.